I have been using Conky as my desktop monitoring widgets for quite some time now. Before this, I’ve been using few applications like screenlets and gdesklets, but there’s a lot of drawbacks on these applications. Among them were limited customizations, it’s difficult to develop your own widgets, unable to find widgets you’re looking for, and if you do find them, they are too buggy to be used in the first place. Then, I’ve found Conky. I’ll never turn back. This is the best system monitor I have ever experienced. It is highly customizable, all you have to do is modify the Conky config file. There’s a lot of widgets/variables to use, such as system monitoring tools (CPU, RAM, SWAP, Hard Drive, etc), batteries capacity, networking, and more. And best of all, it is very, very easy to create your own widgets. If you know any programming language such as Python, Perl, or even a simple Shell Scripts, then you’re off to create your own. Next, create your Conky config file. Here is my config file I’m currently using. In there I’ve created my own GMail notifier, Google Reader notifier and local TV guide, all using Python. 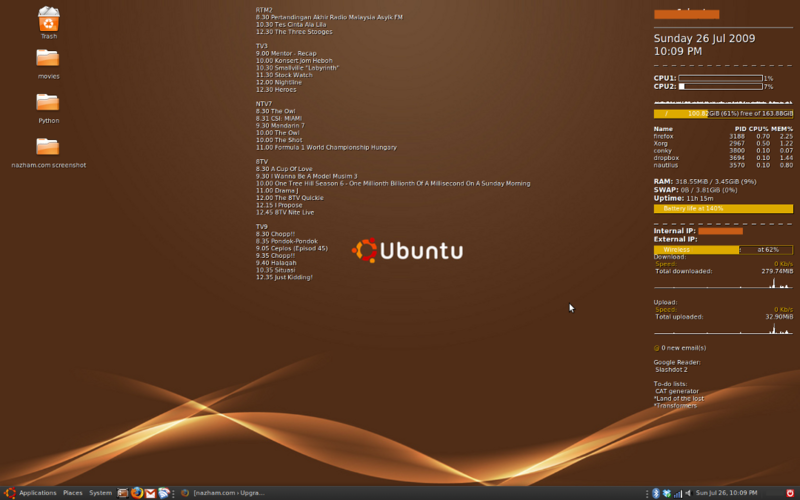 You will find more ideas, screen shots and scripts to use with Conky on Ubuntu Forum. wow..that looks nice..will try this! i’ve installed it on my wife’s machine last night and use your config file (modified). definitely it’s a lot more better than sysmonitor screenlets in terms of resource usage. btw, how do you fix conky always on top of other windows+compiz restart issue? Hi, would you consider posting the python scripts that you use for gmail and google reader?